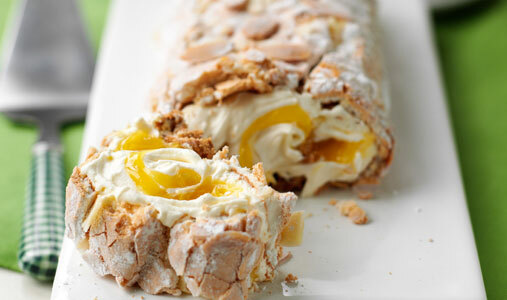 Flaunt your baking skills for the next bake-sale with this show stopping lemon meringue roulade! It’s much easier than it looks and ready in 1 hour 5 minutes for 67p per serving. 1. Preheat the oven to 140°c/Gas 1. Grease and line a 33x23cm Swiss roll tin with baking parchment. 2. Whisk the egg whites until doubled in bulk. Add a tablespoon of sugar and whisk until soft peaks form. Gradually mix in half the remaining sugar. Whisking until stiff and shiny. Fold in the rest of the sugar and the cornflour and spread the mixture evenly on to the tin. Bake for about 45 mins. When cooked, remove and cool uncovered. 3. Turn the tin over on a large sheet of baking parchment, liberally sprinkled with icing sugar, and then carefully peel the paper away from the meringue base. 4. Whip the cream until soft peaks have formed and spread over the meringue. Spread the lemon curd evenly over the cream. Roll up from the short end forming a Swiss roll. Dust with the extra icing sugar. Why not serve with strawberries?